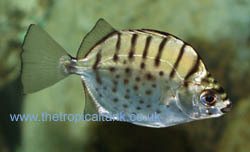 Size: Reported up to 16" (40cm), but usually quite a bit smaller in aquaria. Tank setup: A large brackish tank (80 gallons/360 litres plus advisable for a shoal of adults) with plenty of open swimming space. Branches, roots or bogwood can be used for decor, along with plastic plants if desired. Compatibility: Slightly territorial towards its own kind, and is therefore best kept in a small group to spread out any aggression. Mixes well with Monos. Avoid keeping with delicate fish as they can be quite boisterous. Water chemistry: Maintain in brackish conditions. Juveniles are often sold in fresh or slightly salted water, but medium to high-end brackish or marine conditions are preferable for adults, though the exact salinity is not critical and can be varied to simulate natural conditions. Feeding: Omnivorous, eats any foods offered, so provide a varied diet including plenty of vegetable matter. Will eat live plants. 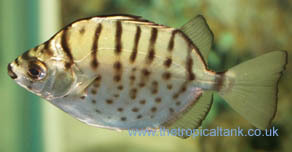 Breeding: Unknown, but changes in salinity are likely to be required. Comments: As a truly brackish fish, this species may wander between full marine, brackish conditions and into freshwater, and can therefore tolerate a wide range of salinities. It is not recommended that they be kept long-term in freshwater in the aquarium. Usually less boisterous than Green Scats (Scatophagus argus).